Grab your martinis and slap on your tuxedos, it’s time to go to the casino! Viaden Media’s Casino for iPad offers an authentic casino experience free of the gimmicks found in other similar apps, while still giving users a robust suite of games to play. Players begin by heading to the virtual bank. “Virtual” is the key word here as the developers make clear from the outset that no real money is involved. You begin with $5,000 in cash, with which you can buy chips to take to the various “rooms”, of which there are five: Poker, Roulette, Blackjack, Slots, and Video Poker. Each room contains two game variations. For example, the Poker Room allows you to play Casino Hold’em or Poker Three, while the Blackjack Room gives you the option of playing either Blackjack Surrender or Blackjack Switch. Each game controls intuitively with the iPad touch controls. Slide chips across the table in poker, tap the spin button and betting options in the Slots Room, and pick your cards in video poker. It all works exactly as you’d expect. And, for novices who haven’t taken out second mortgages to pay for their gambling debts, each game includes detailed and easy-to-follow instructions on how to play, making Casino for iPad a great practice tool before your next trip to Las Vegas. 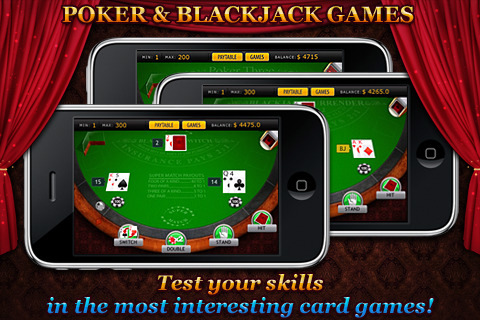 As enjoyable and well-designed as Casino for iPad is, perhaps the most impressive aspect is the overall presentation. In addition to a clean and authentic graphical style, the soundtrack is optimized for each level. While in the Blackjack Room, you’ll hear relaxing lounge music, the jungle-themed “Deuces Wild” video poker board has the soothing sounds of marimba and flute mixed with bongos and other hand percussion, and the Roulette Room gives off the smoky vibe of a piano bar. If you’d like to show off your winnings to your friends, the game is Twitter and Facebook enabled. In addition, Casino for iPad uses OpenFeint for leaderboards so you can compare your bankroll with other gamers worldwide. One final and important thing to note: while the game is titled “Casino for iPad”, this app actually runs on iPhone and iPod Touch, and simply requires iOS 3.2 or later. The experience is much the same on the smaller screen, but it also can make some of the smaller details (the Roulette betting table and the Video Poker details, for example) more difficult to make out and navigate. Nevertheless, Casino for iPad is a great casino app to have in your back pocket. Bottom Line: Casino for iPad is a robust and well-designed casino simulation with tremendous presentation. 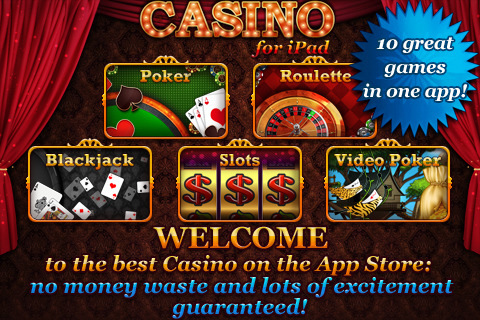 Casino for iPad is compatible with iPad, iPhone, and iPod Touch. Requires iOS 3.2 or later.